Berwick-upon-Tweed [ i/ˈbɛrᵻk əpɒn ˈtwiːd/] (Scots: Sooth Berwick, Scottish Gaelic: Bearaig a Deas) is a town in the county of Northumberland. It is the northernmost town in England. It is located 2 1⁄2 miles (4 km) south of the Scottish border, at the mouth of the River Tweed on the east coast. It is about 56 miles (90 km) east-south east of Edinburgh, 65 miles (105 km) north of Newcastle upon Tyne and 345 miles (555 km) north of London. 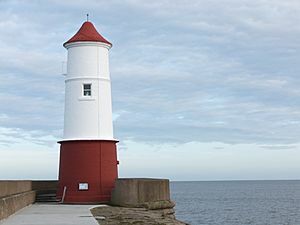 The United Kingdom Census 2011 recorded Berwick's population as 12,043. A civil parish and town council were created in 2008. Berwick was founded as an Anglo-Saxon settlement during the time of the Kingdom of Northumbria, which was annexed by England in the 10th century. The area was for more than 400 years central to historic border wars between the Kingdoms of England and Scotland, and several times possession of Berwick changed hands between the two kingdoms. The last time it changed hands was when England retook it in 1482. 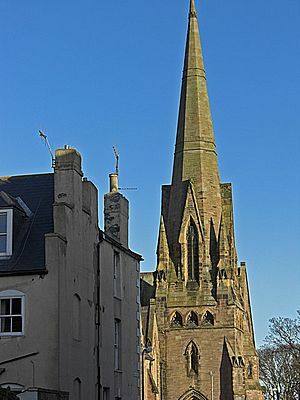 Berwick remains a traditional market town and also has some notable architectural features, in particular its medieval town walls, its Elizabethan ramparts and Britain's earliest barracks buildings (1717–21 by Nicholas Hawksmoor for the Board of Ordnance). Between the late 10th and early 11th centuries, the land between the rivers Forth and Tweed came under Scottish control, either through conquest by Scotland or through cession by England. 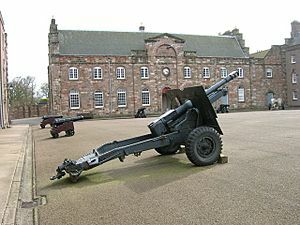 Berwick was made a royal burgh in the reign of David I. A mint was present in the town by 1153. Berwick's strategic position on the Anglo-Scottish border during centuries of war between the two nations and its relatively great wealth led to a succession of raids, sieges and takeovers. William I of Scotland invaded and attempted to capture northern England in 1173-74. After his defeat, Berwick was ceded to Henry II of England. It was later sold back to William by Richard I of England in order to raise funds for his Crusade. Berwick had become a prosperous town by the middle of the 13th century. According to William Edington, a bishop and chancellor of Scotland, Berwick was "so populous and of such commercial importance that it might rightly be called another Alexandria, whose riches were the sea and the water its walls". 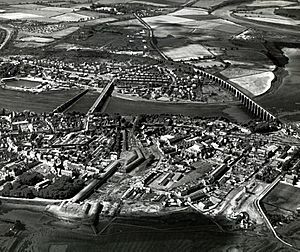 In 1291–92 Berwick was the site of Edward I of England's arbitration in the contest for the Scottish crown between John Balliol and Robert Bruce, 5th Lord of Annandale. The decision in favour of Balliol was pronounced in the Great Hall of Berwick Castle on 17 November 1292. In 1296 England went to war with France, with whom Scotland was in alliance. Balliol invaded England in response, sacking Cumberland. 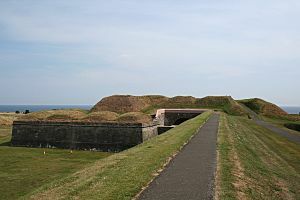 Edward in turn invaded Scotland and captured Berwick, destroying much of the town and massacring many of the inhabitants. Edward I went again to Berwick in August 1296 to receive formal homage from some 2,000 Scottish nobles, after defeating the Scots at the Battle of Dunbar in April and forcing John Balliol to abdicate at Kincardine Castle the following July. It was at this time that work began on building the town walls (and rebuilding the earlier Castle); these fortifications were complete by 1318 and subsequently improved under Scottish rule. An arm of William Wallace was displayed at Berwick after his execution and quartering on 23 August 1305. In 1314 Edward II of England mustered 25,000 men at Berwick, who later fought in (and lost) the Battle of Bannockburn. Between 1315 and 1318 Scottish armies, sometimes with the help of Flemish and German privateers, besieged and blockaded the town, finally invading and capturing it in April 1318. England retook Berwick some time shortly after the Battle of Halidon Hill in 1333. In October 1357 a treaty was signed at Berwick by which the Scottish estates undertook to pay 100,000 marks as a ransom for David II of Scotland, who had been taken prisoner at the Battle of Neville's Cross on 17 October 1346. In 1482 Richard, Duke of Gloucester (later Richard III) recaptured the town. Over the course of a little more than 400 years, Berwick had changed hands more than a dozen times. In 2008 Scottish National Party Member of Scottish Parliament (MSP) Christine Grahame made calls in the Scottish Parliament for Berwick to become part of Scotland again, saying, "Even the Berwick-upon-Tweed Borough Council leader, who is a Liberal Democrat, backs the idea and others see the merits of reunification with Scotland." The Liberal Democrat MSP Jeremy Purvis, who was born and brought up in Berwick, also asked for the border to be moved twenty miles south (i.e., a significant distance south of the Tweed) to include Berwick borough council rather than just the town. stating: "There’s a strong feeling that Berwick should be in Scotland. Until recently, I had a gran in Berwick and another in Kelso, and they could see that there were better public services in Scotland. Berwick as a borough council is going to be abolished and it would then be run from Morpeth, more than 30 miles away." However, Alan Beith, the former MP for Berwick, said the move would require a massive legal upheaval and is not realistic. 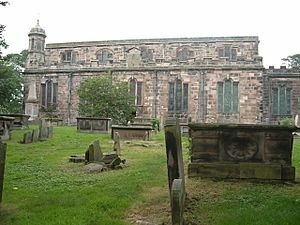 Beith's successor, Anne-Marie Trevelyan, is quoted as saying: "Voters in Berwick-upon-Tweed do not believe that it is whether they are in England or Scotland that is important." Berwick-upon-Tweed has a typical British marine climate with narrow temperature differences between seasons. Because of its far northern position in England coupled with considerable North Sea influence, the area has very cool summers for an English location, with a subdued July (1981-2010) high of 17.9 °C (64.2 °F). January in turn has a high of 6.8 °C (44.2 °F) with a low of 1.7 °C (35.1 °F) with occasional frosts averaging 38.1 times per annum. Precipitation is relatively low by British standards, with 589.2 millimetres (23.20 in) on average. Sunshine is still limited to 1508.5 hours per annum. All data is sourced from the Berwick-upon-Tweed station operated by the Met Office. 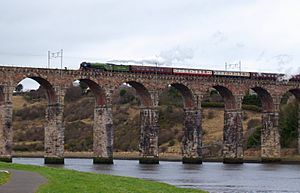 A sociological study of the English-Scottish border region conducted in 2000 found that locals of Alnwick, 30 miles (48 km) south of Berwick, associated the Berwick accent with Scottish influence. Conversely, those from Eyemouth, Scotland, 9 miles (14 km) north of Berwick, firmly classed Berwick speech as English, identifying it as "Northumbrian or Geordie". There is an apocryphal story that Berwick is (or recently was) technically at war with Russia. The story tells that since Berwick had changed hands several times, it was traditionally regarded as a special, separate entity, and some proclamations referred to "England, Scotland and the town of Berwick-upon-Tweed". One such was the declaration of the Crimean War against Russia in 1853, which Queen Victoria supposedly signed as "Victoria, Queen of Great Britain, Ireland, Berwick-upon-Tweed and all British Dominions". When the Treaty of Paris was signed to conclude the war, "Berwick-upon-Tweed" was left out. This meant that, supposedly, one of Britain's smallest towns was officially at war with one of the world's largest powers – and the conflict extended by the lack of a peace treaty for over a century. According to a story by George Hawthorne in The Guardian of 28 December 1966, the London correspondent of Pravda visited the Mayor of Berwick, Councillor Robert Knox, and the two made a mutual declaration of peace. Knox said "Please tell the Russian people through your newspaper that they can sleep peacefully in their beds." 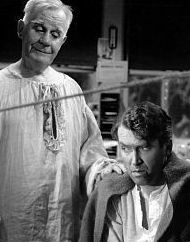 The same story, cited to the Associated Press, appeared in The Baltimore Sun of 17 December 1966; The Washington Post of 18 December 1966; and The Christian Science Monitor of 22 December 1966. At some point in turn the real events seem to have been turned into a story of a "Soviet official" having signed a "peace treaty" with Mayor Knox; Knox's remark to the Pravda correspondent was preserved in this version. The Old Bridge, 15-span sandstone arch bridge 1,164 feet (355 m) long, built in 1610–24 for £15,000. The bridge continues to carry road traffic, but in one direction only. 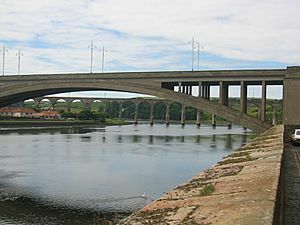 The bridge, part of the main route from London to Edinburgh was ordered by James VI and I.
Berwick-upon-Tweed Facts for Kids. Kiddle Encyclopedia.